At this rate, Blue Apron Holdings Inc (NYSE:APRN) is on pace to become the worst IPO in history. Blue Apron stock went public at $10 in late June. In less than nine months, APRN stock already has lost nearly 80% of its value. Bear in mind that APRN stock originally was priced at $15-17 per share and that Blue Apron shareholders basically haven’t had a single reprieve. Save for a short-lived rally in December, Blue Apron stock pretty much has gone straight down. And there’s little reason to see the trend changing. Investors briefly cheered a Q4 “beat” last month. But increasing competition, an unprofitable business, and debt maturing just 17 months from now keep the bear case intact. Some 37% of APRN’s thin float is sold short. Those traders are betting, essentially, that Blue Apron stock will go to zero. That’s the prediction I made myself in December. Three months later, that still seems the most likely outcome. The only question might be when. Fundamentally, the case for APRN stock heading to zero is rather simple. The company closed 2017 with $228.5 million in cash, which seems like a reasonable cushion. Blue Apron also has $124.7 million in debt on a revolving facility that matures in August 2019. This is a company that burned roughly $276 million in 2017 alone. That figure, admittedly, will come down. Capital expenditures were $124 million in 2017; they are guided to just $20-$25 million for 2018, per the Q4 conference call. Adjusted EBITDA was a loss of $138 million in 2017; management expects that loss to be halved this year. With cash interest expense likely in the $4 million range, guidance suggests that Blue Apron will burn another $100 million or so this year. By year-end, then, Blue Apron won’t have enough cash to repay its debt even if it meets its own expectations. At that point, Blue Apron can refinance the debt and extend the maturity. But ahead of those discussions, which likely will start toward the end of this year, Blue Apron has to be performing better. If 2018 results disappoint and Blue Apron’s loss is higher than expected, those lenders aren’t going to throw good money after bad. And so there’s a real chance that Blue Apron could have to restructure next year, at which point Blue Apron stock likely would be worth zero. Admittedly, that’s not the most likely outcome. Improvements at the Linden, New Jersey distribution center can secure a refinanced loan. An equity offering could raise some capital as well (though at the current APRN stock price, it would require significant dilution). And better performance would help. Blue Apron probably can kick the can down the road past 2019. But what then? Whatever the timing, at some point, Blue Apron has to turn profitable. To do that, it’s going to have to grow revenue and improve margins. That’s a tough combination. Q4 revenue declined 13% year-over-year, due largely to lower marketing. Blue Apron focused on getting the new Linden facility operating properly before ramping up marketing here in Q1. But even with some success, gross margin still fell 190 bps in the quarter. Even from an EBITDA standpoint, Blue Apron still lost more than a dime on every dollar of revenue in the quarter. Revenue is guided to decline in 2018, per the Q4 call, with adjusted EBITDA margins still in the negative 9% range for the full year. Blue Apron is targeting breakeven adjusted EBITDA in 2019, along with a return to revenue growth. Even hitting those targets, however, Blue Apron likely isn’t generating cash until 2021 — at the earliest. And hitting those targets will be tough, for a number of reasons. The most notable is competition. Blue Apron already is losing share to rival Hello Fresh. Walmart Inc (NYSE:WMT) is entering the space. So is Kroger Co (NYSE:KR). Albertsons, who is going public through its merger with Rite Aid Corporation (NYSE:RAD), acquired Blue Apron rival Plated last year. 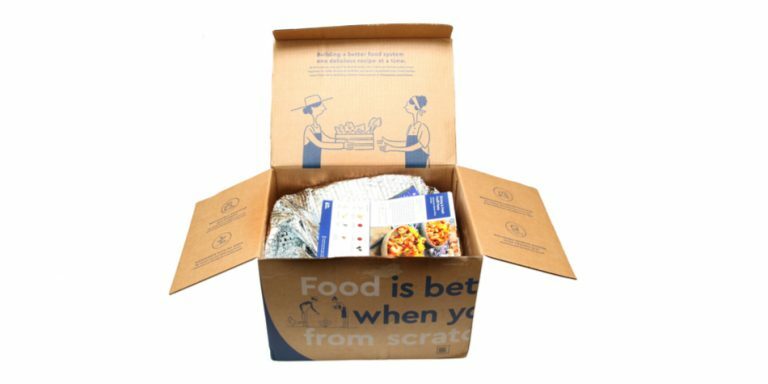 Blue Apron’s response, according to recent reports, is to consider selling its own kits in stores. But which stores? Retailers won’t stock Blue Apron kits if they’re developing their own. Even smaller chains like Smart & Final Stores Inc (NYSE:SFS) or Ingles Markets, Incorporated (NASDAQ:IMKTA) might prefer selling their own prepared foods (which have higher margins) to Blue Apron kits. And here, too, the margin problem arises. Blue Apron’s gross margins are under 30%. There’s not much room left to pay supermarkets for their shelf space and cover incremental shipping and distribution costs. This simply looks like a company that’s boxed in. And it’s not as if Blue Apron stock is all that cheap. Even assuming breakeven EBITDA in 2019 and some level of profit in 2020, APRN stock still trades at 10x+ that 2020 EBITDA on an enterprise basis. In a grocery store space where 6-7x multiples are common, that hardly seems like a deal. And so, even with APRN stock barely above $2, the stock still is pricing in years of consistent growth in a brutally competitive space. That type of performance clearly is far from guaranteed. And yet, with anything less, Blue Apron shareholders likely are wiped out — if not next year, then some time not long after that. Article printed from InvestorPlace Media, https://investorplace.com/2018/03/blue-apron-stock-is-heading-to-zero-and-maybe-soon/.